One of my colleagues, Geetu, whose areas of interest are Luxury and Girly Gadgets has been bitten by the green bug. She decided to shape up a keyed picture frame to lock the memories of her loved ones. 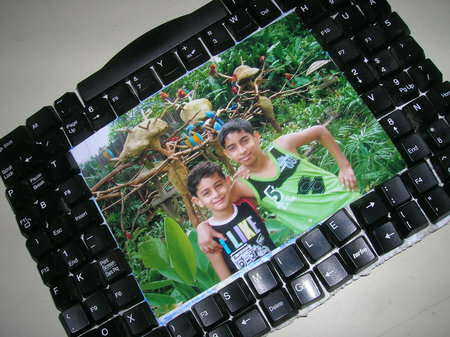 And here is her share of story – ‘I had a non working keyboard lying in the house and didn’t know what to do with it until got inspired by the green sites and thought of making this geeky photo frame. All you need for it is some waste cardboard/thermocol, glue and keyboard buttons. Unscrew the keyboard and push all the buttons out (this is the most enjoyable part). Then according to the buttons size make holes in the base and finally set all the buttons. This part will require lots of patience. Finally an awesome green-geeky photo-frame is ready.’ This is certainly inspirational for kids too. It will also help to educate them that we can put such things to used instead of seeing them off to e-waste landfills.